Pieced boutique pillow with damask center and ruched linen sides. EXCLUSIVELY AT NEIMAN MARCUS Pieced neck roll with tassel fringe and rosette ends. Front, polyester/chenille polyester/cotton/silk/rayon. Back and fill, polyester. EXCLUSIVELY AT NEIMAN MARCUS Pieced neck roll with tassel fringe and rosette ends. Front, polyester/chenille polyester/cotton/silk/rayon. Back and fill, polyester. 7"Dia. x 24"W. Dry clean. Made in the USA of imported materials. 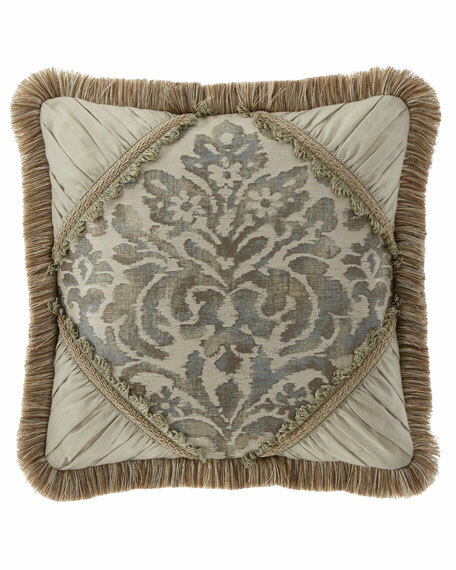 EXCLUSIVELY AT NEIMAN MARCUS Pieced oblong pillow has ribbon loop fringe and rosette center. Front, polyester/chenille polyester/cotton/silk/rayon. Back and fill, polyester. 14" x 20". Dry clean. Made in the USA of imported materials. Sherry Kline Home Tinsley Basket-Weave Pillow, 18"Sq. EXCLUSIVELY AT NEIMAN MARCUS Basketweave pillow with linen back. 0.5" top stitched flange with zip closure. Polyester/acrylic/cotton/rayon. Feather/down insert. Dry clean. 18"Sq. Made in the USA of imported materials. EXCLUSIVELY AT NEIMAN MARCUS Fringe and gimps diamond lattice pillow. Twisted cording finish. Zip closure. Front, back, and fill: polyester. EXCLUSIVELY AT NEIMAN MARCUS Fringe and gimps diamond lattice pillow. Twisted cording finish. Zip closure. Front, back, and fill: polyester. Dry clean. 16"Sq. Made in the USA of imported materials.